To make the barbecue sauce, heat the oil in a frying pan, then cook onion and garlic for a few mins until soft. Add the rest of the sauce ingredients to the pan with a good pinch of salt and simmer for 20 mins. Use a hand blender or food processor to whizz to a smooth purée. Heat oven to 150C/130C fan/gas 2. Make the rub by mixing all the ingredients together with a pinch of salt. Rub the mix all over the beef and set aside. 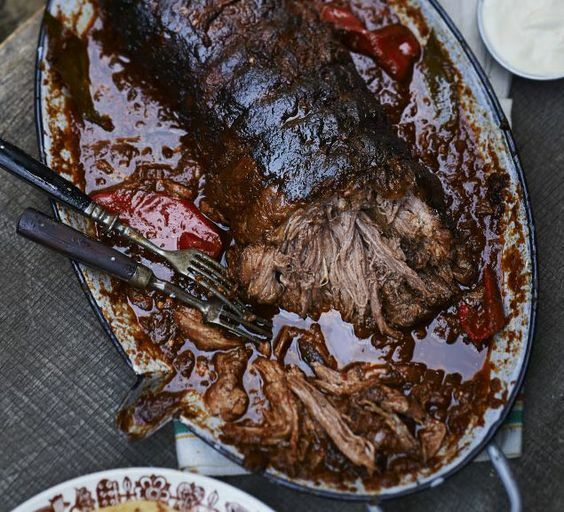 In a large roasting tin, mix the beef stock and ½ the barbecue sauce. Add the brisket to the tin, cover tightly with foil, then cook for 4-5 hrs until the meat is really tender when you push a fork into it. The beef can be prepared the night before – just leave it to cool in the tin covered with foil, but don’t refrigerate. To finish the beef, get a barbecue fired up and wait until the coals are completely ashen – you want a low, not fierce, heat. Lift the beef out of the roasting tin and place on the barbecue to char. If your barbecue has a lid, close it now. Cook for about 20 mins, turning it carefully with tongs, until lightly charred all over and heated through. Lift onto a board and serve sliced with the remaining barbecue sauce on the side.